We had a visit from a little furry friend today as we were about to eat dinner. 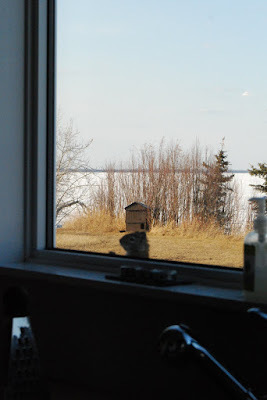 A little squirrel was running back and forth from the bank of the lake to the house. It then decided to climb up to my kitchen window to take a little peak inside and luckily I managed to take a quick shot of it. The boys were ever so excited. Another sign that spring is indeed here even though we woke up to a blanket of snow on the ground this morning which all melted by the afternoon. Oh, if you are wondering what that is right above the squirrel. It's our two floor cat house which we built two summers ago when we had lots of cats, but they all disappeared now. Maybe the little furry friend can stay in there instead. I've always wanted a pet squirrel. Awwww. What a cutey! Perfect picture too.